The Weber classification is used to determine the severity of tibiofibular ligament injury by the level of fibular fracture. The Weber B fracture consists of a fracture of the fibula near the joint and a transverse fracture of the medial malleolus (or disruption of the deltoid ligament). This results in partial disruption of the tibiofibular ligament complex and is from supination-lateral rotation injury. 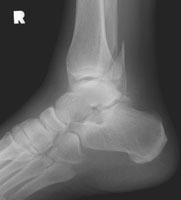 A Lateral radiograph of the ankle. There is a fibular fracture, near the level of the tibiotalar joint. B Mortise radiograph of the ankle. The fracture is seen to arise at the same level of the tibiotalar joint, indicative of a Weber B injury.